The Donald McKay School in East Boston, where I serve as principal, has always reflected our community not only in terms of population, but also in spirit and approach. For generations, immigrant strivers have called East Boston their Gateway to America. Today, East Boston is home to the highest percentage of foreign-born citizens in any Boston neighborhood. Here, we are the proud educators of the next generation of strivers in a school that is 89 percent Latino, the majority of whom are English language learners. More than 50 percent are economically disadvantaged. Every child deserves a high-quality education that recognizes and respects his or her dignity and humanity, and that relishes in the stories of school and community. That’s why teachers and schools like ours across the country are doing their life’s work, nurturing the dreams of students in the heart of an immigrant community. Five years ago, our school was in the bottom six percent of schools in the state. By 2016, we were categorized in the top tier in the state’s accountability system, surpassing the district average in literacy and math MCAS scores. In that time, we’ve empowered our teachers and students, and we’ve created a safe and welcoming environment for students and families. The core of our improvement has been a collaborative professional culture led by teachers where learning, experimentation and reflection are encouraged. This way forward could be the way forward for the nation. To support students acquiring a second language, we have focused on building structures for ESL teachers to collaborate regularly with inclusion and general-education teachers. We view these students as “emerging bilinguals” who build on the assets they bring to the classroom. McKay teachers are also empowered to drive their own professional learning by determining their own learning foci for the year. Teacher-leaders are given time and autonomy during the day to collaborate across content and grade levels. They observe classrooms, share ideas, set goals and guide professional learning in the school with support from school administrators along the way. This other side of the equation — student empowerment — has been just as essential. Voice and choice have been embedded in all aspects of the school day. We offer a variety of electives from which students can choose. Student circles have not only been transformative in strengthening our classroom communities but also have given students opportunities for leadership, as they have grown to design and facilitate student-led circles. Perhaps most importantly, students have become the driving forces behind initiatives to ensure that everyone is welcome in our school community. In recent years, this has included a student-organized Immigrant Pride Week, a week of events that culminated in a student-led march designed to inform, advocate and empower students and families. In a perilous time for so many of our students and families, our school has made a concerted effort to ensure every family is welcomed, supported and respected at our school. This message is supported by actions such as sharing Immigrant Rights Resources in multiple languages and through meetings and information sessions in partnership with local organizations. We do this work because providing emotional support to students and families during difficult times can bridge more than achievement gaps. It can create lifelong connections that go beyond language or cultural differences to help students become the best versions of themselves that they can be. In addition to academic gains over the past several years, we have seen a steady improvement in social and emotional concerns as measured by the Behavior Intervention Monitoring Assessment System, a universal screening tool, as well as dramatic decreases in suspension rates. At the heart of all this work is a strategy and “whole student, whole teacher” focus that other schools can learn from. We have built a community where teachers are treated and trusted as the experts they are. They are true decision-makers who feel a collective responsibility to meet the needs of all students and their families, who in turn feel empowered to have a voice in their own education. We believe this is the way forward, for every child. This story about immigrants was produced by The Hechinger Report, a nonprofit, independent news organization focused on inequality and innovation in education. Sign up for our newsletter. 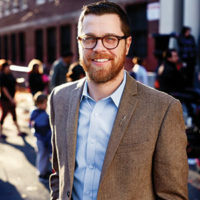 Jordan Weymer is principal of the Donald McKay K-8 School, winner of the 2018 Thomas W. Payzant School on the Move Prize, given each year to an improving Boston public school by EdVestors, a Boston-based school improvement nonprofit.